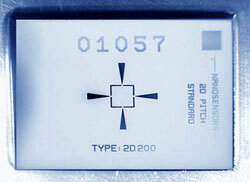 The standard (2D200) is used for a very precise x-y-calibration of the scanning mechanism. The standard consists of a 2-dimensional lattice of inverted square pyramids with 300nm pitch etched into a silicon chip. The silicon chip is glued onto a stainless steel sample holder with 12 mm diameter. This holder can be magnetically or mechanically fixed. The product will be shipped in a Gel-Pak® carrier. This standard has been developed in close cooperation with the German national authority of standards: PTB (Physikalisch Technische Bundesanstalt). Due to this PTB is able to certify this standard in accordance with international guidelines. Please contact Working Group 5.25 Scanning Probe Metrology at www.ptb.de directly. The active area is located in the center of the chip and is surrounded by the FindMe structure. The lattice of inverted pyramids make up the active area.